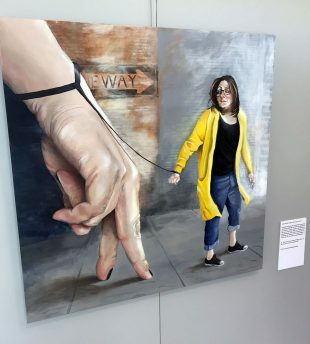 An exhibit titled “GRIP: Conversational Portraits on Mental Health” by artist Cara Jean Means is on display in the George S. & Dolores Doré Eccles Art Gallery at South City Campus. 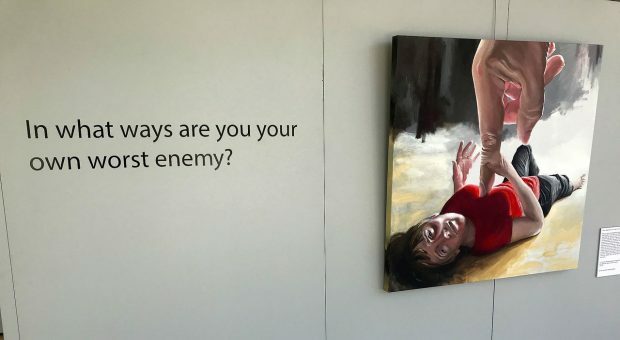 The topic of the exhibit originates from Means’ experience with anxiety and depression following a series of negative events, including the death of her parents. She first mistook her anxiety for a medical issue rather than a mental health issue until her husband, Marc Means, suggested otherwise. “The more we talked about it, I realized that when he would tell me over the years, ‘I have anxiety,’ I never really understood it personally. I was definitely sympathetic and would try to help figure out how to help him, but this was the first time in all of our years of marriage that I ever physically felt it myself,” says Means. Her experience with mental health issues inspired her to visually represent what it felt like and to share her story. Soon, she realized that she wanted to broaden her scope and include the stories of her husband, Marc, as well as various friends, family members and even complete strangers. Means used the subjects of her paintings as models, preferring to work with the actual representatives of the art rather than a professional model. She listened to the subjects’ stories and their suggestions for composition of the portraits but ultimately guided the process. “Almost everybody I talked to said they feel like they’re not allowed to talk about [mental illness] or feel like if they do talk about it, [they’re] not heard,” says Means. Means had two paintings featured in the Salt Lake Community College President’s Art Show last year. Shortly after, art gallery and event specialist Danielle Susi contacted her about having an exhibition at SLCC. “I wanted to do the GRIP exhibition now because it overlaps with Disability Awareness Week. 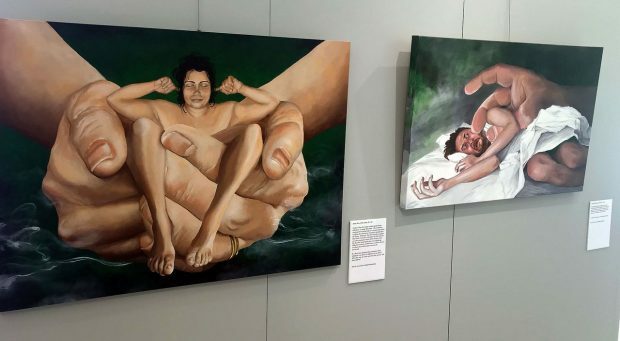 [We’re] actually partnering with the Disability Resource Center to host Cara Jean for an artist talk about mental health as a disability,” says Susi. Means will visit the South City Campus on Sept. 20 at noon to participate in the talk. Means hopes the GRIP series acts as an amplifier for the issue of mental health and facilities a conversation about the topic, whether that be sharing ones’ story or listening to the stories of others. Her ultimate goal when she set out to paint the series was a sort of, “traveling educational art experience” rather than paintings made to be sold to the first bidder. She plans to take this series to various universities, community centers, and possibly clinics. Outside of this series, Means has been working on a mural at 300 W. and 800 S. as part of a Salt Lake City Redevelopment Agency commission for 11 murals in SLC’s Granary district. A walking tour and opening reception will be held on Sept. 29 to view the murals and talk to the commissioned artists. Additionally, Means has begun to conceptualize her next painting series. While Means goes back to the laboratory to develop her next masterpiece, students at SLCC will be able to enjoy her pieces at South City Campus for a bit longer. 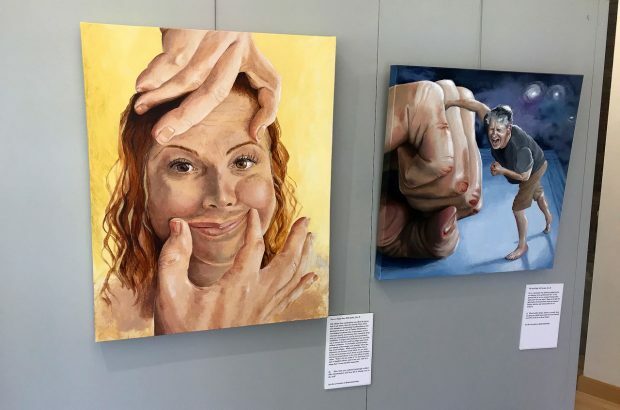 The GRIP series is on display at Salt Lake Community College through Sept. 26.